I am an outdoors girl. Well, ok, I’m not talking camping, nature hikes or triathlons. 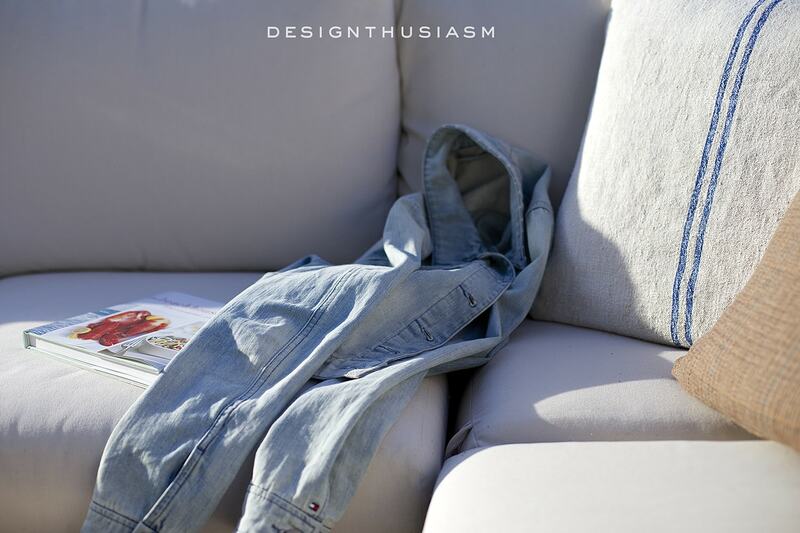 No, I’m thinking more like lounging in the sun and dining alfresco. That I can do all day, every day! 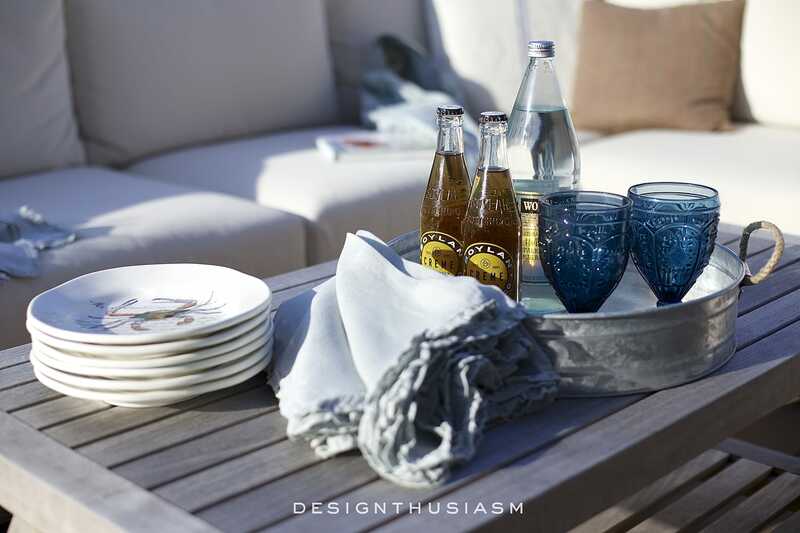 So as the weather begins to warm, my thoughts turn toward preparing the patio for summer entertaining. You can imagine my delight when I learned that Cost Plus World Market would be opening a new store in New Jersey and that they would be inviting a few local bloggers to a grand opening shopping event and that we would be compensated to share our experience with you. Yes, please! If you’ve ever been to a World Market, you know my concern was not that I wouldn’t find anything I liked enough to endorse, but rather that the options would be endless. I picked my very favorites for this post, but there’s truly so much more. With that in mind, and with thoughts of summer entertaining swirling in my head, I set out for the new Cost Plus World Market in Paramus, New Jersey. 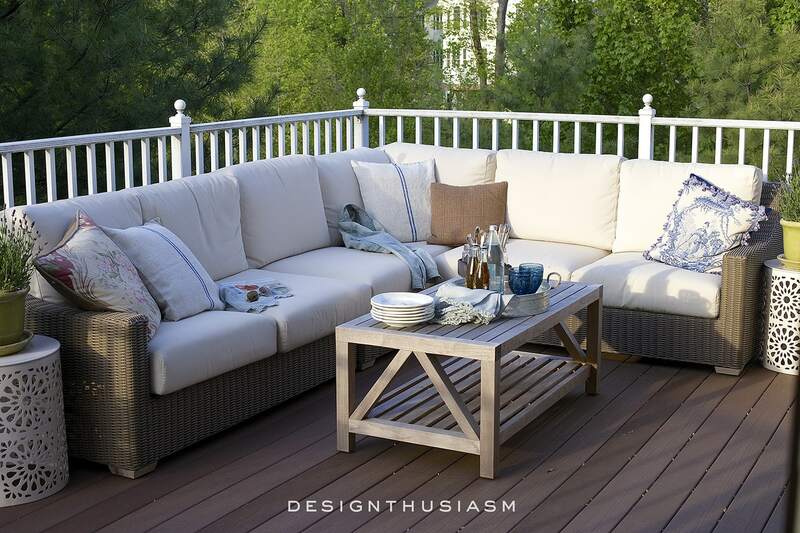 I was barely through the door and past the charming and friendly salesperson when I saw the basis for the look that would update my patio for the coming summer. These wonderful White Metal Soleil Drum Stools are the perfect complement for my existing sectional seating, could function as end tables while providing extra seating when necessary and were very affordable. I’ll take two! Next it was time to address serving my guests. Last summer we had just moved into our home and I never really got everything I needed to appropriately serve outside. 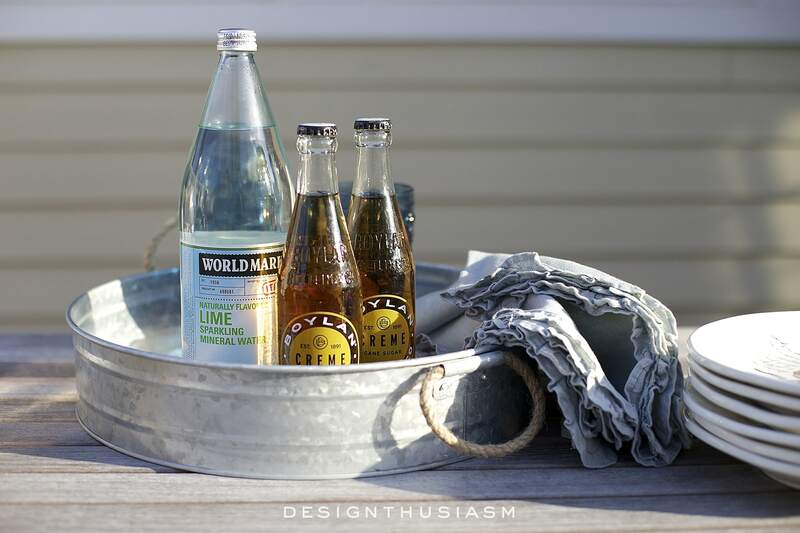 I love this galvanized tray with rope handles as it has just the right vibe I was going for here – rustic and casual, with almost a vintage edge. The store has many looks from brights to spice tones, but I wanted to go sun-bleached to coordinate with my aesthetic. 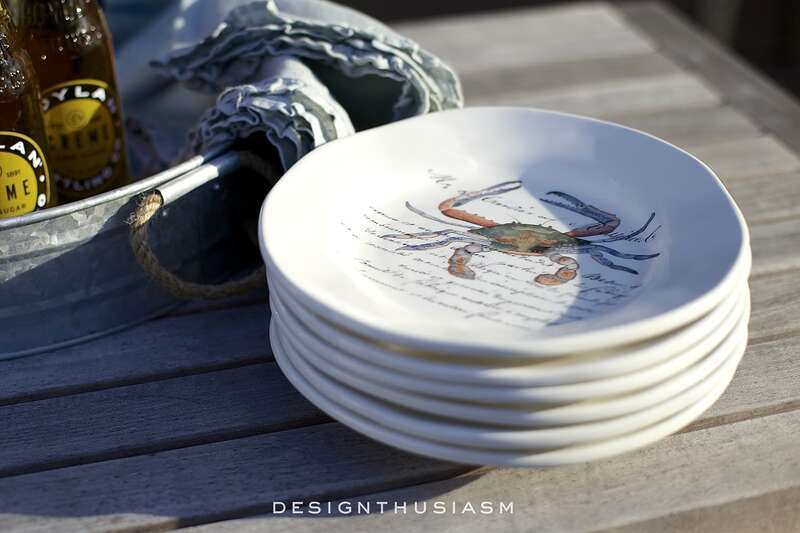 These fabulous Italian Sealife plates are what really anchored my theme, beachy and coastal but with a subtle sophistication and lovely artwork. On my patio, space is limited, so we eat on the sectional and coffee table and my serving pieces need to accommodate this arrangement. If you didn’t know World Market carries food and drink, it’s something you really must check out. 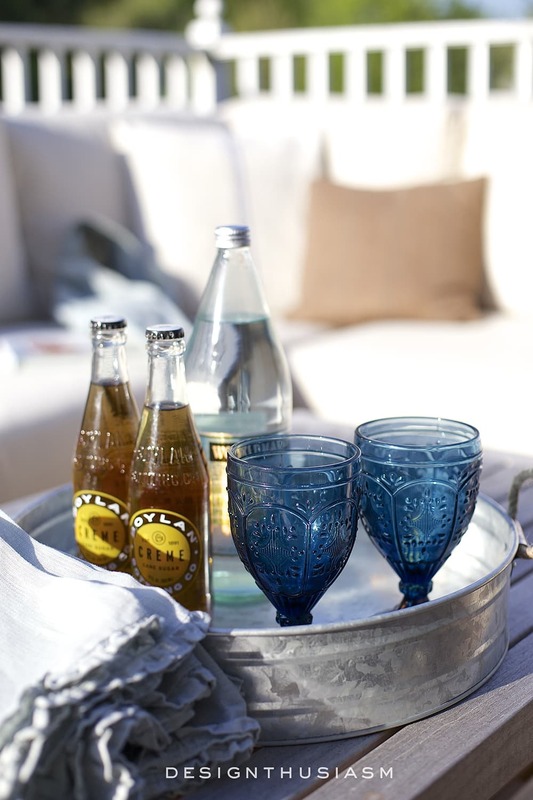 Many of the selections have an old world feel, and our tray serves up a sparkling water and sugared drinks. 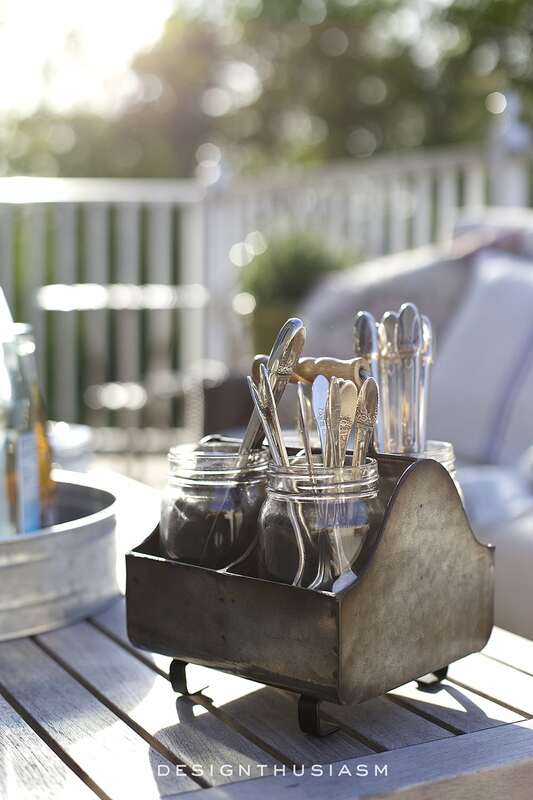 This wonderful little mason jar caddy is ideal for corralling silverware when we’re eating outside. Its vintage feel adds character to the setting. 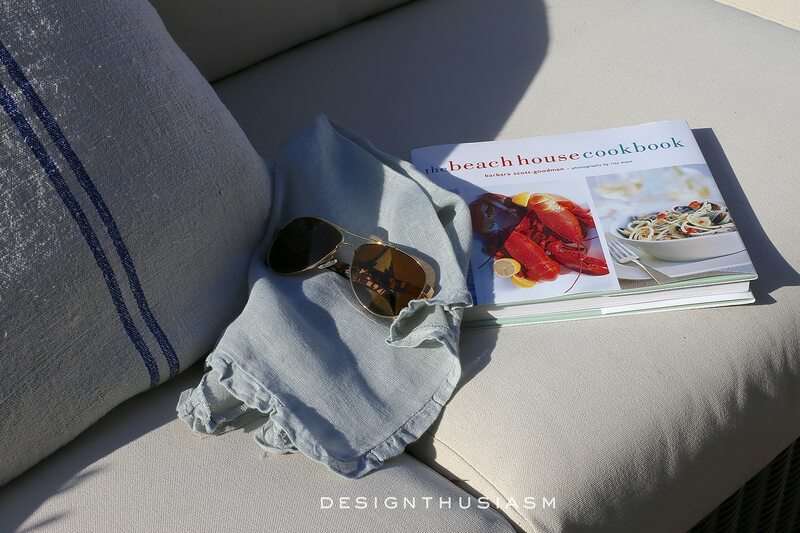 One of my favorite finds was this Beach House Cook Book. It pretty much screams summer to me! 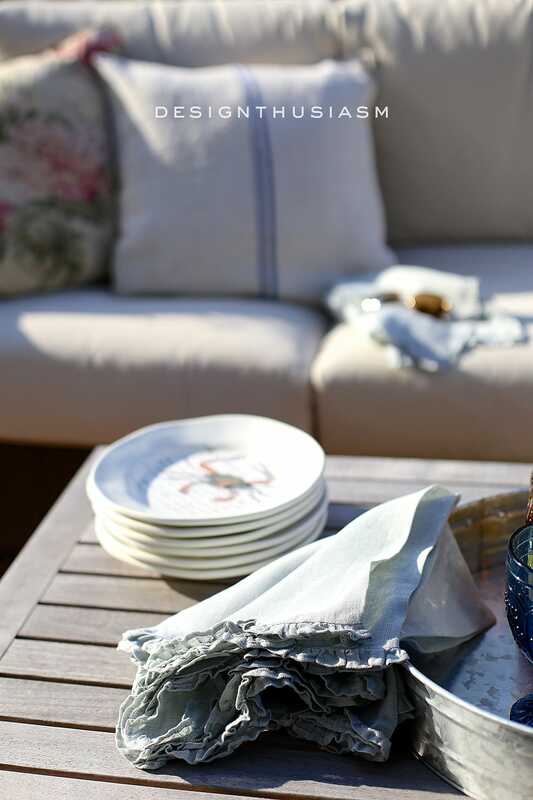 The items I found worked nicely with some existing pieces I already owned, from the indigo goblets to the ruffled chambray napkins. 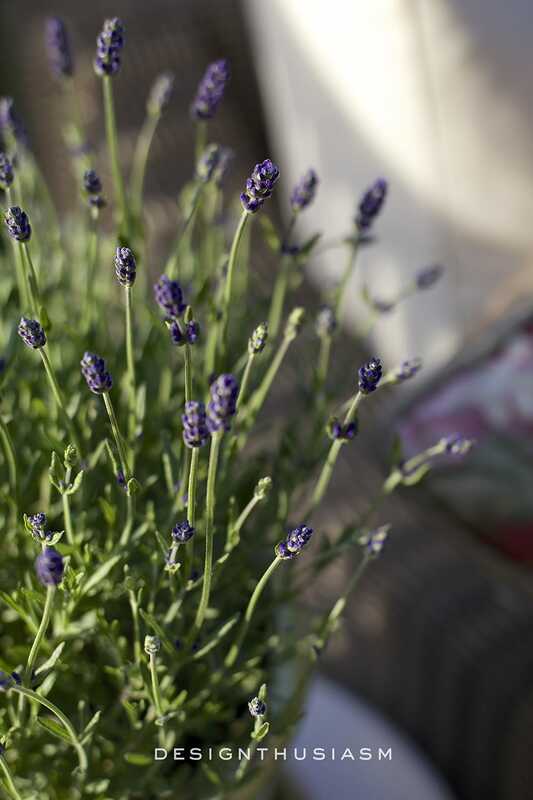 Good Morning, just discovered your lovely blog and thoroughly enjoyed several posts. Your style is impeccable. Thank you for sharing your beautiful home and lifestyle! Thank you so much, Cheryll and welcome!! Cost Plus is one of my favorite places to shop and “spruce” up a space. Loads a fabulous and affordable items to enhance and update the home. 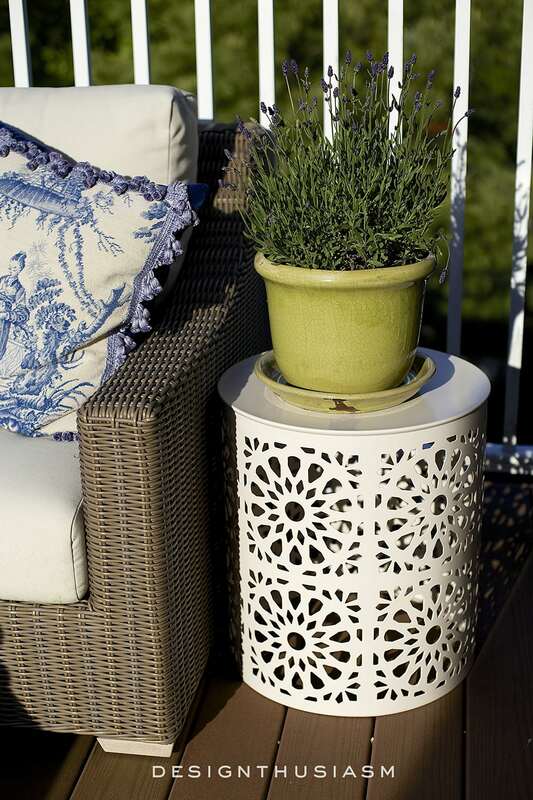 I love how you incorporated your already loved items with some new pieces to freshen your patio! Thanks, Valerie! This was such a fun project and now I can’t wait for the weather to warm up for good… 🙂 We’ve had so many teases this spring but then it gets cold again. SO waiting for summer!! World Market is one of my favorite places to shop. If you like coffee (and I do), they have a wonderful coffee rewards program, as well as shopping rewards in general. I have a difficult time resisting their dinnerware and must confess to having treated myself to this same set of Italian sea life plates. Aren’t they marvelous? Great post! Thanks Pattie! And yes, I love them too… 🙂 You can look forward to seeing the plates in an upcoming tablscape post, so everyone can see the full spectrum of the art offered! Thanks for visiting!! Warmer weather can’t come soon enough (hasn’t this been a crazy spring up here in the tri-state area–it was so cold last night). Trips down the shore, eating outside with the aromas coming from the grill, sitting outside late in the evening watching a star-filled sky and being lulled by all the night sounds–Oh, yes, yes, yes–I am so ready! Gorgeous Lory! Love everything!!!! Such a stunning outdoor space. And your photos are so lovely! Lory… just came over from Tina’s blog. WOW!!! Where have you been all my life??? I adore your taste. I will definitely be back. I am now going to have another cup of joe and peruse all your past posts. Have a great week. Ha ha, thanks so much, Katie!! I actually found your account on Instagram through Tina… 🙂 I love your taste too!! Welcome! This looks like the perfect spot to chill and relax! We don’t have a World Market here but I’m going to Atlanta next month and I will check it out. Ah, it’s a must! I only recently found them too… 🙂 You will enjoy!! Lory, thanks for the summer inspiration! 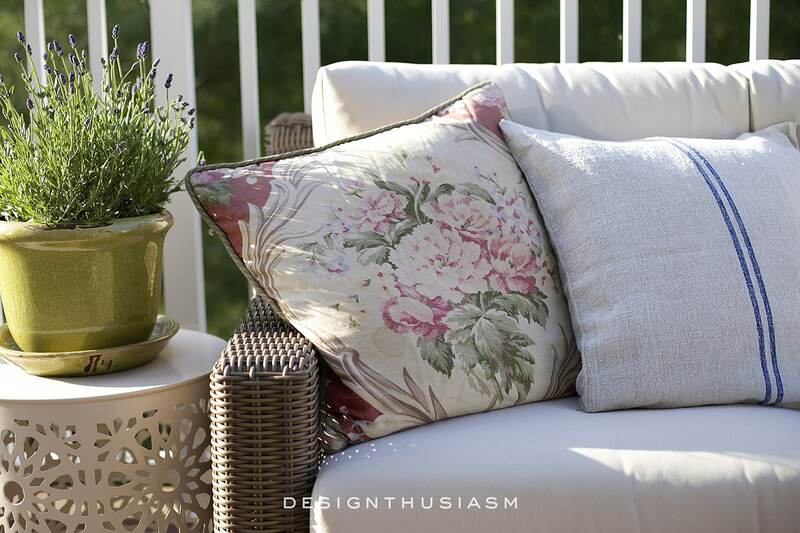 I want to have an afternoon tea party this summer either on the patio or in the gazebo, and the patio definitely needs some help!